In its fourth public hearing, the Andes Flood Commission gave a Cliff Notes version of its final document to a small, attentive audience on May 8th. The Commission admitted ruefully that there is “no silver bullet” for flood mitigation in Andes. One immediate step they recommend is to anchor propane tanks in the flood plain. The Town Board has already sent out notices to affected residents of funds available to anchor their tanks. At its May meeting, the Town Board approved the document which recommends the building of a Flood Mitigation Shelf along the Tremperskill through the hamlet and over the soccer fields and tennis courts at ACS, as well as the relocation of stream-side outbuildings. It suggests zoning regulations to prevent new ones appearing; even mentions the possibility of raising some vulnerable structures above FEMA’s 100-year flood range. The report does not mandate the Town to do anything. Every action would require an individual owner’s approval and cooperation. It does envision the reassembly of the hard-working Flood Commission to advise the Town Board and offer continuing education to Andes residents. During the Privilege of the Floor section of the meeting, Marianne Greenfield introduced Jackie and Charlie O’Hara of Wolf Hollow Road. The couple wants the Town to designate a 20’x20’ square on their land as the “Reynolds Cemetery on Wolf Hollow Road.” They will maintain the ground, grant public access and replace the broken stone marking the grave of Merritt Reynolds who died in 1826. The Board approved. Mary Davis and Joe Damone received approval for the use of Ballantine Park on either August 26th or September 9th for a music and food event to benefit the Andes Public Library. At a request from Ms. Davis, John Bouton, Highway Superintendent, agreed to have the residue of gravel from winter road work cleared so “the town would look nice” for the library’s Garden Tour on July 14th. 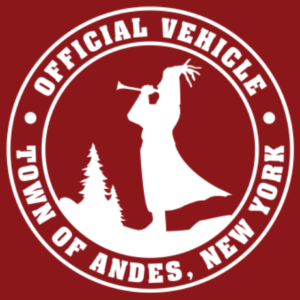 Town Supervisor, Bud Gladstone, presented a new logo for the Highway Department trucks designed by Peter Ames. Board members suggested some revisions and additions (e.g. “Serving 110 miles of road!”) but the idea of putting an Andes brand on our trucks was approved.